DYMARK-SPRAY INK is specially formulated for stencil applications. The unique formulation minimises build-up when used on stencils. 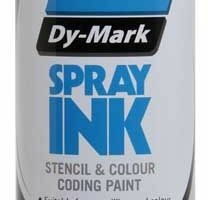 DYMARK-SPRAY INK in Blue with a unique formula to minimise build up when used with stencils. Other colours in stock to use for colour coding.